The Japanese sword, more commonly know as the Samurai sword, was a superb weapon. Its unique edge-tempering (compared to the full-blade tempering of the famous Toledo and Damascus swords of Europe) allowed a degree of hardness and razor- sharpness impossible to attain in European swords without danger of brittleness and breakage. The fear and respect which the Japanese warrior and his sword inspired among Oriental foes is recorded in many contemporary accounts. But beyond its quality as a weapon, the Japanese sword is important as one of history's finest expressions of the metal worker's art. The art of sword making required high technical knowledge, great patience, persistence and a true religious devotion. The greatest Japanese sword smiths led a religious form of life, abstaining from all excesses, and accompanying each step of the work with prayer and ritual. The actual forging of the blade was a complex process. Strips of two, or three different grades of steel, or of iron and steel, were welded together by the smith's hammer. The resulting billet of metal was then folded upon itself and hammered out again to its original length and thickness. This process was repeated many times, until the final blade consisted of many thin, tightly welded layers of the original metal. When the forging was completed, the sword smith used file and scraping knife to give final shape and finish to the blade and tang. As a result of the forging and finishing process, the un-tempered portion of the blade (Hada) of the Japanese sword frequently shows a unique patterning of the metal similar to wood grain. The most critical of all the sword making processes was the tempering of the edge. The smith began by coating the entire blade with a thin layer of a clay, sand and powdered-charcoal mixture. Then, using a sharp bamboo stick, he inscribed a line a short distance back from the edge. The character tern of the tempered portion of the blade. Variations in shape of the tempering line are among the fine points of classification used by Japanese sword experts. Material between the scribed line and the edge was removed and the rest of the coating allowed to dry. Then, the sword smith heated the entire edge over his pine charcoal fire until the proper temperature (judged by the color of the heated metal) was reached. Finally, the glowing blade was plunged into a tank of warm water. There are four basic types of Japanese swords; two of them short (less than 24 inches) and two of them long (more than 24 inches) in blade length. The Samurai warrior always carried a pair of sheathed swords - one long and one short - with the types carried depending upon the occasion. When clad in armor or in formal court dress, the Samurai wore a long sword called the TACHI, slung edge-downward from his girdle or sash. The matching short sword, usually less than 12 inches in length, was a TANTO. It was worn thrust through the girdle and secured by a cord, and like the TACHI, the TANTO was worn edge-downward. In ordinary dress, the Samurai's long sword was the KATANA. This sword, often nearly three feet in length, was thrust through the girdle, edge-upward. The KATANA was normally considered the fighting sword. 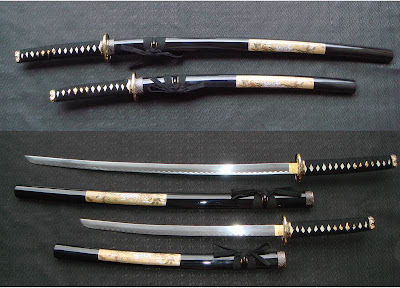 Its companion was the WAKIZASHI a sword of between 12 and 24 inches in blade length. It too, was thrust edge-upward through the girdle. Many Japanese swords were decorated with engraving or inlay work on the blade, although the major decorative work was usually reserved for the TSUBA, or guard; the FUCHI, a collar encircling the hilt at the guard end; and the KASHIRA or pommel-cap. These were often embellished with high-relief carving, engraving, etching, piercing, inlay work, incrustation with precious metals, or a combination of these techniques. The scabbard (SAYA) was usually finished with lacquer, and had decorated metal fittings. Finishing of the sword hilt (TSUKA) begins with a covering of the white pebbled skin of a ray fish. Then, flat silk braid is wrapped over the hilt in a pattern which leaves a row of lozenge-shaped openings on either side, exposing the white ray skin. Identification of swords requires removal of the TSUKA, which may be accomplished by carefully forcing out the single tapered wooden peg (MEKUGI) which fastens it to the tang. The TSUKA may then be slid off the tang, revealing the maker's signature and other identifying marks incised in the metal. The signature often consists of the maker's name, his titles, and place at which the sword was make. The date of manufacture, when shown, is usually found on the other side of the tang. Certain patterns of file marks on the tang are also distinctive, aiding the expert in determining the authenticity and dating of the sword. Monetary value of the Japanese sword obviously depends upon many factors, such as; age, condition, maker and historical associations, but we can all appreciate the value of any of these swords as magnificent examples of the artistic ability and dedication of the Japanese sword smith. The practice of performing cutting tests on swords was begun in the KOTO period, (prior to 1600), the tests were performed on various combinations of materials, i.e. bundles of bamboo laden with mud and tied, helmets, horn, iron of various degrees of hardness, and last but not least, the human body. The practice of using human bodies was begun as a means of crime control, for instance, the sentence for a convicted thief would probably be the loss of a hand or arm. The various strokes were given in relationship to the severity of the crime committed. Stroke #1, RIO-KURUMA, (Pair of Wheels), being the most difficult to perform as the blade must pass through both hip bones at the thickest area, was the least often successful with one stroke. RIO-KURUMA was prescribed for only the most serious of crimes. The ease of performance increases with the number, (i.e. #1 most difficult, #18 least difficult). The practice of amputation as a form of punishment is used (even today), in various Arabian countries, although it was abandoned in Japan about the time of the Emperor Mei Ji, (1868). Swords were tested only by licensed testers at official testing grounds. The results of the test along with the date and name of the tester were then inscribed, (mainly in gold), on the tang of the sword. Swords bearing cutting tests are very desirable to collectors, as the cutting test greatly enhances the value of the sword, it should also be borne in mind that there are many forgeries of cutting test, (as they could easily be inscribed at a later date), the tester whose name appears on the tang must be checked for authenticity with known examples of his signature. So, did you find Japanse swords articstically made, while visitting Japan? 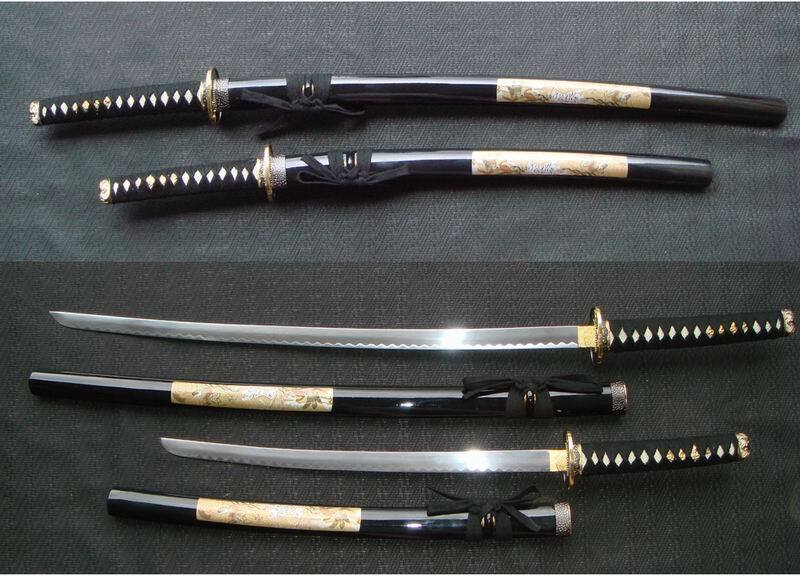 We can also get a custom-made katana samurai sword. some good top golf clubs to you. how old are these swords? look shining and bags eye catching. The actual history of Asuna is known to have begun in the very beginning of the twentieth century.